Lot size opened are very small at 0.01, How can I increase the lot size? if i'm not wrong, you should be able to change the lot size in the setting window of the ea after compiling the code. Many Thanks to Antonis Michos for providing the Survivor EA code. Also, Thanks to nufan Post #12 for providing the code to increase the Lot sizes. 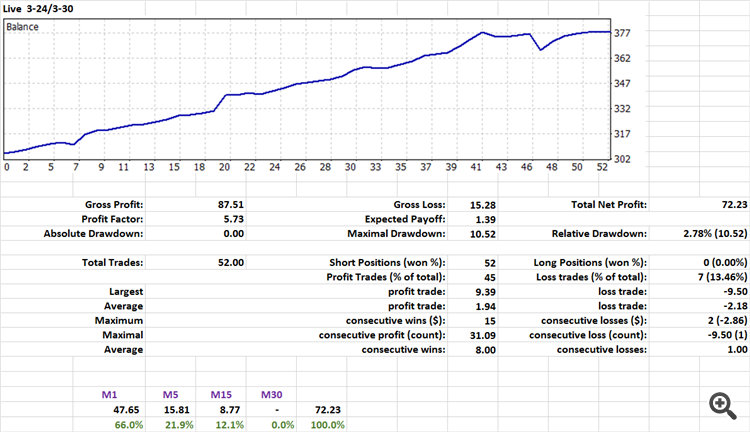 This appears to be a steady profit maker with very low draw down and high winning percentage. I back tested many pairs in M1, M5, M15 and M30 using Dukascopy tick data. (99% modelling quality) I ran the best prospects in demo for one week 3-17/3-23 2019 / .01 Lot / 76.37 profit counting 1 Loss at .33 USD. See the Balance chart below. I started Live trading on 3-25-19 (March 25). $58.50 Net Gain / .01 Lot / including three losses at less than 1.00 USD as of March 28. nufan's code to add User defined Lot size appears to be working in the tester. We will see how this EA works long term, but this is one of the best EA starts I have experienced in the 3 1/2 years I have been in Forex full time. I have attached the Survivor EA .mq4 with nufan's user Lot Size input modification, File Survivor-3.mq4. I am seeing a close correlation of positive four week pair/TF back tests to profitable Demo and Live results. If a pair and TF is not successful in tick data back testing, it appears to be a high probability it will lose money in Live trading. I know the optimization gurus will scream "curve fitting", but if I keep keep getting positive results, I will change my user name to Curve Fitter. I will post an update with Live results in the next few weeks. interesting EA look promising, save , but I try in demo account forwward and backtest , only open very few open trade, may work in multiple pair , please wich pair did you use in your test?? 16 pair? Question about the OrderSend (there is only one with the variable "type"), I've seen it just open short positions: is it part of the strategy or must be completed?